Good afternoon, lovelies! 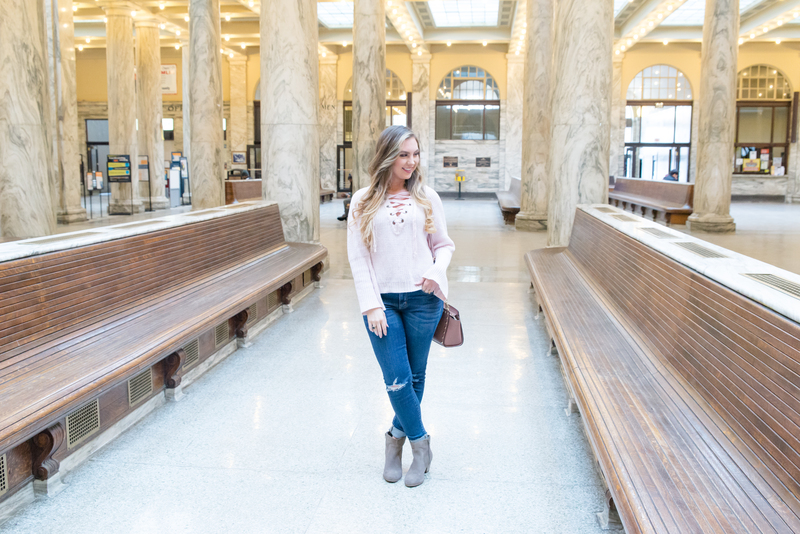 Today, I’m talking about this adorable sweater from Goodnight Macaroon. 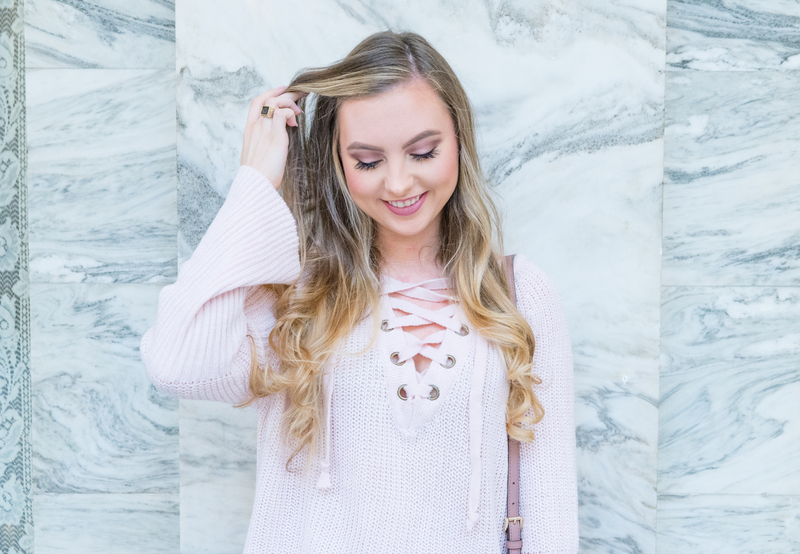 I am loving this lace up trend and the baby pink color is too adorable to pass up. The material is so soft and I also love the bell sleeve detail. This sweater never fails to get me compliments whenever I wear it. Goodnight Macaroon is full of super cute pieces including my Valentine’s romper! Every Tuesday, they have a flash sale of 50% off select pieces which is the perfect time to purchase something you’ve been eyeing! I will definitely be purchasing from them again! Fun fact, this was actually the first outfit Molly took photos of! I wanted to keep the outfit pretty casual and comfortable because I wasn’t sure how the shoot would work. 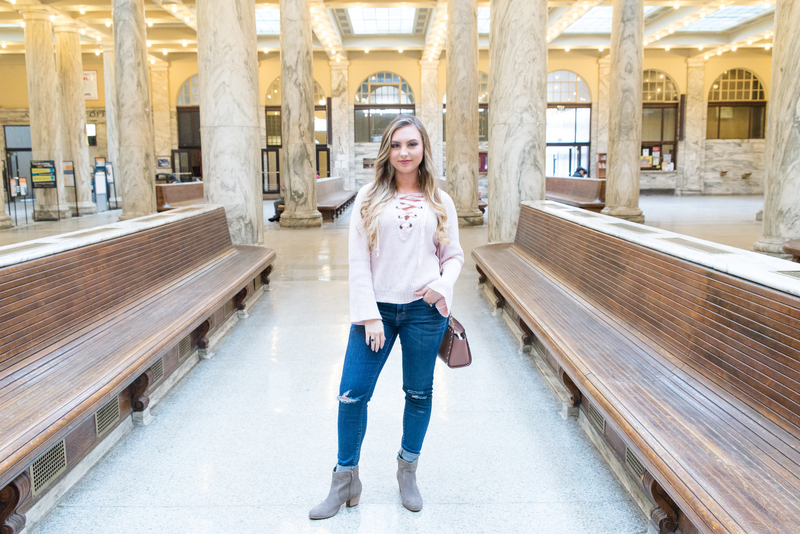 Of course, Molly made it super comfortable and fun and captured all of the details of the outfit perfectly! These jeans are from American Eagle and as I’ve mentioned in a previous post, they have my favorite jeans. These aren’t completely destroyed so I like to wear them to subtly dress down fancier tops and add a casual vibe. As for accessories, you’ve seen these boots in at least three posts now so you know how often I wear them! Comfy, trendy, Sole Society has great shoes. 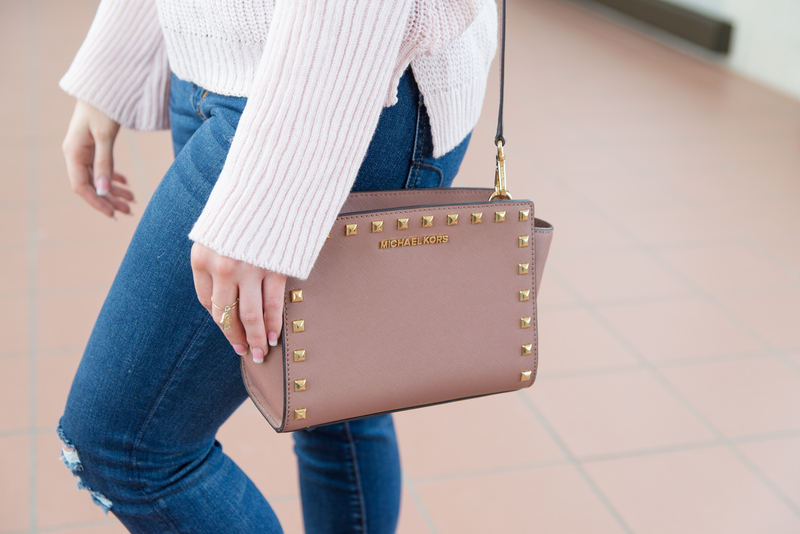 I bought this Michael Kors bag around the Christmas before last and I highly recommend this style. 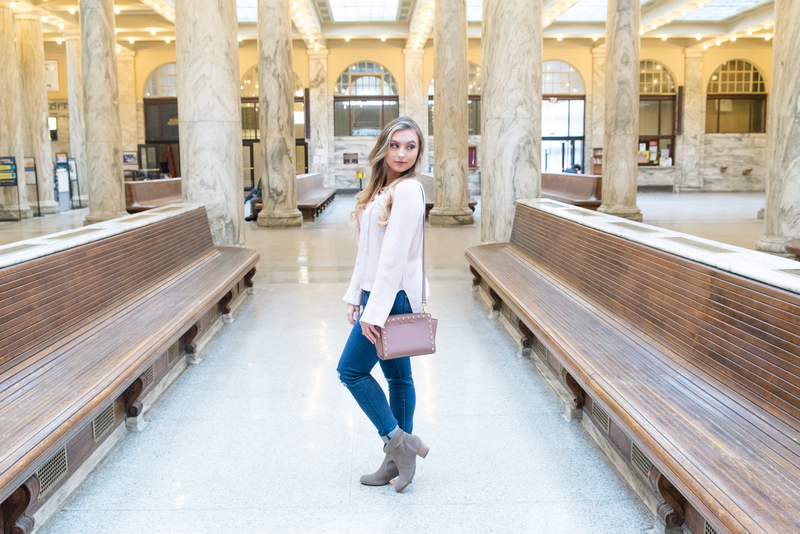 The size is perfect for carrying all of your essentials and I love the mauve color that goes with almost everything. 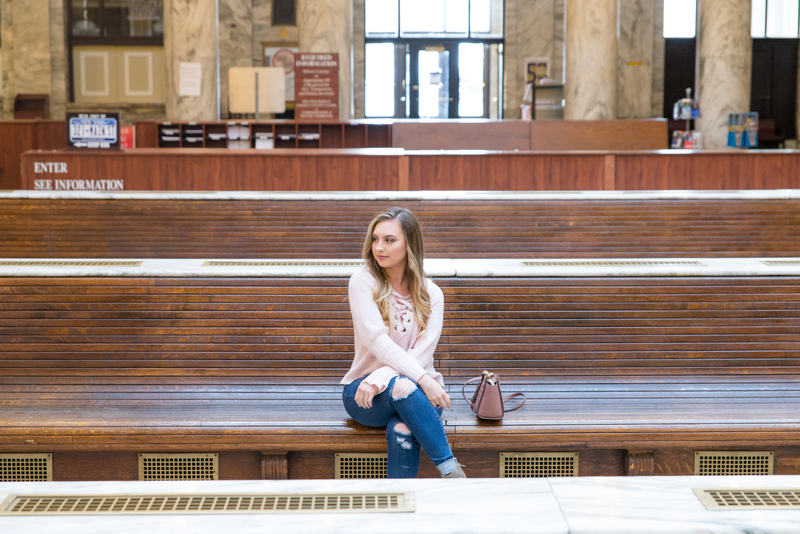 Union Station will always be one of my go-to places for photos in Utica. The marble lobby is simply stunning and a perfect backdrop. Plus, it is never too crowded so you only have like five people giving you weird looks while taking photos lol. Where is your favorite place to take photos in the Utica area? Let me know in the comments below! Be sure to also include suggestions for posts you’d like to see on the blog! Have a great week!